How does a theatre troupe take a poorly written play and make it a successful production? Not easily. The Majestic, from those onstage to those backstage, do their damnedest to create the absolute best possible work with the material given. For those who experienced "Escanaba in da Moonlight," presented at this venue ten years ago, one cannot help but laugh again, simply upon remembering that play's dialogue and action. Given "Moonlight's" hilarity, it is hard not to expect the same from "In Love." Taking the production as it stands, there are many fine qualities to what is especially a drama about how to define love, coupled with some laughs. 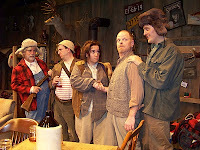 The story takes place in Michigan in 1944 at a hunting cabin. Gramps and the men in the family are on their annual quest to kill deer. No women allowed - this is a guy thing. Greg Trochlil's decrepid, rustic, messy set is exquisite for its purpose. The details are perfect, from the ripped upholstery to the birch trees. The task of the actors to make their characters' words depict real people is brought to the test. Each in the quintet is excellent, albeit in primarily caricature roles - quite common it many plays. The interaction increasingly becomes better, poignant, and humorous with the entry of each new character. John Thomas Waite's and Chris Shanahan's roles set the long opening-act scene. Save for a few off-color jokes, their story-telling is serious. Enter Shaun Barry (a former Majestic "regular" who has been long missed) as a friend whose role is weaker than the actor deserves. Paul DeVries, as the youngest male in the family, is wonderful as the naïve and smitten son. Upon the scene is "the woman," Big Betty. Meghan Lynn Allen takes her job seriously; at the same time deservedly getting the most laughs in the play. Her make-up is dirt, her clothes are plaid, and her demeanor is raunchy. Yet, Allen gives Betty a hidden charm. A recommendation is to arrive early to see the Majestic's new second floor gallery. Featuring the work of 30 local artists, this is a lovely exhibit/store.